Prime Minister Narendra Modi has supported a “sovereign and independent Palestine” and expressed hope for the return of peace in the region during his meeting with Palestinian President Mehmoud Abbas in Ramallah on Saturday. He is the first Indian PM who visited Palestine without touching down in Tel Aviv. Modi appreciated that Palestinian people have continuously shown exemplary courage in extremely tough times in spite of unstable environment. He said that “the way you moved forward in such a situation is praiseworthy, we appreciate it”. On this occasion President Mehmoud Abbas expressed his desire to engage in negotiations. He said “We rely on India’s role as an international force in the non-alignment movement and in the international for a, in a way that is conducive to desired peace in our region”. He further said that “It is my honor to welcome you as a great guest, on your first historic visit to Palestine which holds, to you personally and to the people of India, sentiments of love and appreciation. Indian leadership has always stood by peace in Palestine”. Modi skipped visit to Palestine while visiting Israel in July 2017 signaling his government’s decision to treat New Delhi’s relations with two countries as “mutually independent and exclusive”. President Mahmoud Abbas conferred the “Grand Collar of the State of Palestine” order to Prime Minister Narendra Modi in recognition of his contribution to enhancing ties between India and Palestine. This is the highest order given to given to foreign dignitaries – Kings, Heads of State or Government and persons of similar rank. King Salman of Saudi Arabia, King Hamad of Bahrain and President Xi Jinping of China are amongst those who were earlier conferred the same honor. On his arrival in Ramallah, PM Modi tweeted, “this is a historic visit that will lead to stronger bilateral cooperation”. He placed a wreath at the mausoleum of the late Palestinian president Yasser Arafat. Meanwhile, US President Donald Trump’s Jerusalem move causing loss of mediator’s credibility in the Middle East crisis has given a fillip to India’s position in the international arena. This was felt during Prime Minister Narendra Modi’s meeting with Palestinian President Mehmoud Abbas in Ramallah on Saturday. Before the two leader’s meeting a senior Palestinian official said that Mehmoud Abbas will ask PM Modi to support muli-county sponsorship that would enable to replace the US as sole mediator in future negotiations between Israel and Palestine. Palestinian leader, while visiting New Delhi in May 2017, expressed desire that India play important role in influencing Israelis and other stake holders for peaceful resolution of the crisis. Since US President Donald Trump has recognized Jerusalem as the capital of Israel and asked Department of State to begin process of moving its embassy from Tel Aviv to Jerusalem, Mehmoud Abbas has been reiterating that Washington has lost the credibility of playing mediator’s role in the conflict. However, Palestinian leader has not received support for multi-national mechanism for mediating between Israelis and Palestinians. Prime Minister took a chopper’s ride from Jordanian capital Amman to Ramallah in West Bank, the headquarters of Palestinian Authority. Reports say that PM Modi was escorted by Royal Jordanian helicopters and Israeli choppers on his journey to Palestine. Mehmoud Abbas is considered to be soft leader towards Western and Israeli approach towards Palestine considering they will fecilitate establishment of Palestine as independent state. Ghaza, the other remaining Palestinian territory, is ruled by Hamas, considered to be pro-Iranian resistant group. Qatar has also been supportive of Hamas of late. 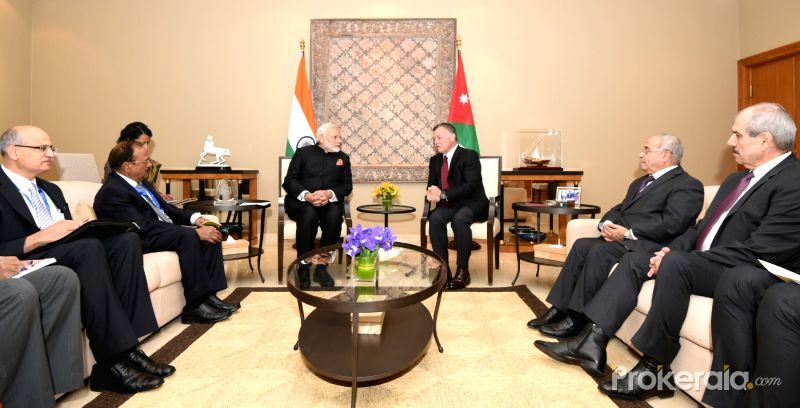 In Amman, PM Modi held “wonderful” meeting with Jordanian King Abdullah II that would boost bilateral ties. King described the meeting as the “beginning of a new chapter” in the ties between the two countries. Reports say that talks between the two leaders covered the Palestinian cause and Jordan’s role in protecting Islamic and Christian sites in Jerusalem, based on Hashemite custodianship over the holy shrines. Modi arrived in Amman on Friday. After visiting Palestine, he is scheduled to visit UAE and Oman. In an attempt to strengthen cooperation in trade, investment and energy security, PM Narendra Modi is on four nation tour. He is scheduled to reach Abu Dhabi Saturday evening on the invitation of UAE President Sheikh Khalifa bin Zayed Al Nahyan. He will address World Government Summit in Dubai, where India is the Guest of Honor country. Meanwhile 12 agreements will be signed between the two countries. He will also visit a temple constructed by Indian community in that country. Later, he will visit Muscat, the capital of Oman. Meetings with Indian Diaspora in UAE and Oman will also figure during the visit to these countries. PM Narendra Modi’s Palestine visit came at a time when Israeli PM Benjamin Netanyahu has recently visited India on a six day long landmark trip. Besides New Delhi, Netanyahu visited Agra, Ahmedabad and Mumbai. The post India supports sovereign and independent Palestine appeared first on APN Live.